Havasu Falls is arguably one of the most spectacular and picturesque waterfalls in the United States. Located in Northern Arizona, it is a 10-mile trek through a deep canyon from the parking lot to the falls. The water is a beautiful turquoise blue and it plunges down a 100-foot limestone cliff to the refreshing swimming hole below. And further downstream you’ll find Mooney Falls and Beaver Falls. While they aren’t as notorious as Havasu, they are every bit as beautiful. The hike to Beaver falls from Mooney Falls is about 2.3 miles one-way and there are several water crossings to get there (read more detail about the hike here). You may also want to wade around in the pools below both Havasu and Mooney Falls where the rocks can be slippery and difficult to see. So packing a pair of durable and lightweight water shoes is highly recommended. 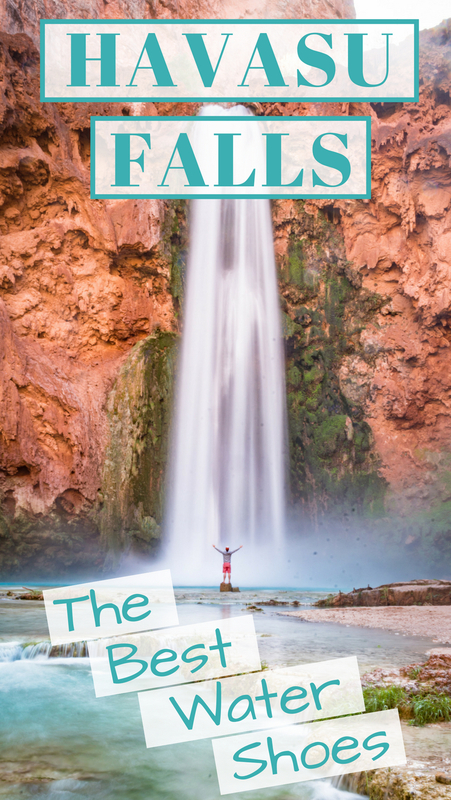 Check out this list of our favorite water shoes for your journey to Havasu Falls. 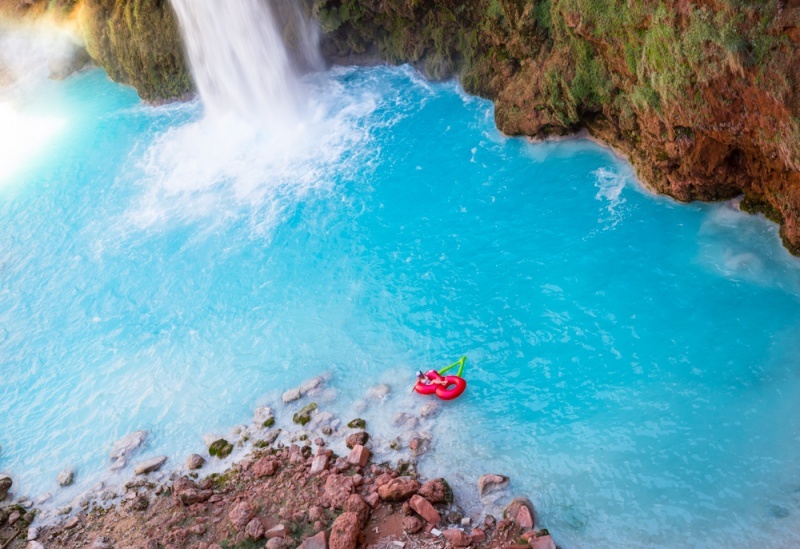 And be sure to read our complete Havasu Falls packing guide to help you prepare for the epic adventure that awaits you! If your pack is already too heavy and you can’t bare the thought of bringing both hiking shoes AND water shoes to Havasu Falls, then these KEEN’s are perfect for you – they can be both! Offering both comfort and functionality, you can wear these during your exhausting 10-mile trek to the campsite, and then keep them on while wading through the water crossings en route to Beaver Falls. 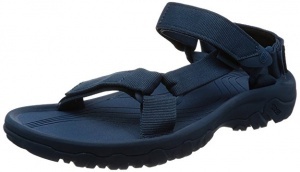 Synthetic webbing straps that are designed to mold to your feet. Quick-draw elastic cord lacing keeps them snug even when submerged in water. Water resistant lining and an antimicrobial Aegis Microbe Shield treatment keeps away funky foot odors. 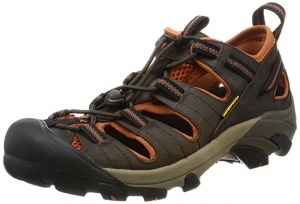 Stellar traction for clambering over rocks during your trek. 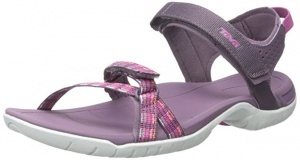 Tevas are a leader in water sandals as they are comfortable, durable, and lightweight. While we wouldn’t recommend that you do the entire 10-mile trek in these, they are easy to clip to the outside of your pack and won’t weight you down. They also offer great traction to keep you from slipping on the rocks that lie under the water. Durable and quick-dry webbing upper. Hook-and-loop closure allows you to get them on and off quickly, even when wet. Antimicrobial technology to reduce odor. 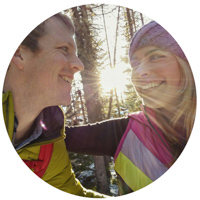 If you are interested in both exploring and helping the planet, then you’ll love the work that the Chaco brand is doing. Not only are the outsoles of these sandals composed of 25% recycled rubber, but they also donate 3% of after-tax profits to various organizations that care for people and the planet. Polyester jacquard webbing that provides a customized and secure fit. Textured, vegan-friendly grooves on footbed for traction. 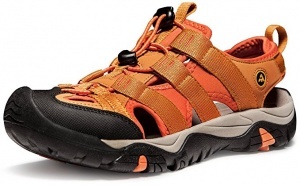 Contoured arch support for a comfortable trek. 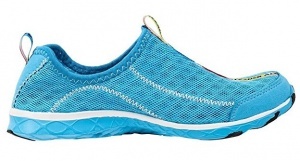 If you don’t want to invest in a pair of high-quality water shoes because you’re afraid you’ll only use them once or twice, then the Aleader Mesh Slip-on Water Shoes are perfect for you. They won’t add a lot of weight to your already heavy pack nor will they break the bank. Mesh shoes that are breathable and quick-drying. Water Grain soles that provide traction in slippery conditions. If you’re looking for the water resistance and traction of a water shoe but don’t necessarily like the way they look, then opt for this flip flop sandal from Crocs. They are made from the same Croslite material that the brand is famous for, making them comfortable, lightweight, and with great traction. But because they resemble a flip flop as opposed to a water shoe, you can get more use out of them after your trip is over. An ankle strap to keep them secure when wading through the river. A Croslite sole for unbeatable traction. A massaging nub footbed to keep your feet comfy, even for long distances. 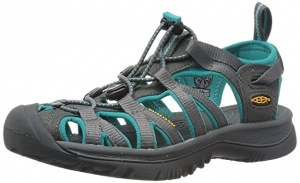 This KEEN sandal combines the best features of both a hiking shoe and a water resistant sandal in one! Offering open side vents for maximum breathability, waterproof leather for wandering through river crossings, and super durable outsoles to cover rough terrain – these will keep you comfortable for all of the hiking you’ll be doing in Havasu Falls. Made of water resistant leather and fabric. Bungee lacing system for a snug fit. Super durable soles to tackle any extreme terrain. The super lightweight Teva Hurricane XLT is the perfect sandal to clip onto your pack and bust out during your hike to Beaver Falls. The contoured footbed will keep you comfortable for long walks and the durable soles provide great traction in both wet and dry conditions. Polyester webbing for a comfortable fit. A durable rubber sole that provides traction on slippery surfaces. Velcro straps make them incredibly easy to get on and take off. These sturdy, durable water shoes are the perfect option if you don’t want to spend a lot of money on shoes you may only wear for this trip. They’ll get you safely through your water crossings and you won’t feel guilty if you decide to toss them afterwards because their price is right. Three layers of toe protection for harsh terrain. Soft fit lining on straps for a comfortable walk. These lightweight, super flexible water shoes won’t absorb water, are odor-resistant, and are incredibly easy to clean. While they aren’t necessarily meant for trekking on land, they are perfect to slip-on and off during your river water crossings. They also make for comfortable footwear while you’re relaxing around camp. Rubber outsoles with grooves that provide traction on slippery surfaces. Do you have any favorite water shoes that we should add to the list? Comment here! And be sure to read our Complete Packing Guide for Havasu Falls to help you prepare for your trip!